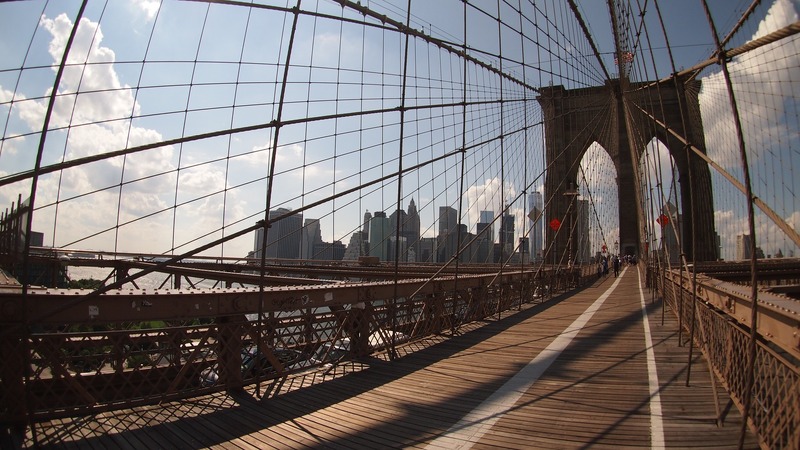 Downtown Manhattan…Empire State Building…this is cool and all, but no trip to NYC is complete without a visit to the Brooklyn Bridge. 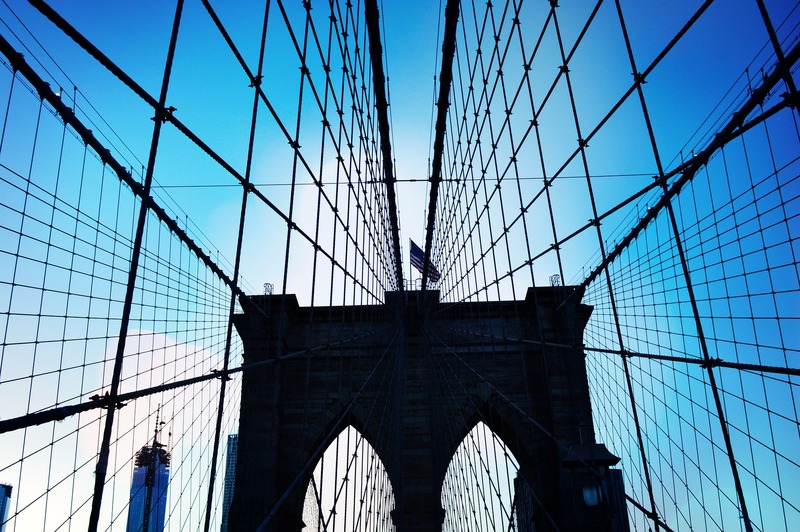 You can take your selfie at the Statue of Liberty, or pay a ridiculous amount to go up to Empire State Building, but you also need to squeeze in time for the Brooklyn Bridge. The New Yorkers and tourists all know this, hence the giant mobs of people taking pictures and trying to sell you something along the walk from Manhattan to BK. (On one run I’ve seen someone walking around with their pet snake). On a typical run through New York City it’s too crowded on the sidewalks to get a nice stride going. That’s when you’d consider moving to the bike line, but oh wait, now the bikers are running into you and cussing you out. Okay, so since the bike line doesn’t work that just leaves you to dodge the tourists and taxis in the city. That’s exactly how it should be done. If you want to be a Weekend Warrior and do all of your runs at Central Park like everyone else then so be it. If you prefer to run while hitting all of the hot spots in the city, then don’t take the casual advice of timidly jogging in NYC. Don’t be stupid and fly straight into cars, but it doesn’t hurt to have a little fun right? A lot of my teammates run across the Brooklyn Bridge after we’ve started to become bored with our usual route along WSH (Westside Highway) in Manhattan. We cross through City Hall and line ourselves up ready to take on all of the tourists and sketchy guys trying to sell us selfie sticks. The bridge only lasts about 2.5 miles altogether if even. During these 2 miles, we deal with the angry bikers blasting their way through traffic and right in the middle of crowds. At least as runners, we have the ease of stopping at a common sense approach of people. Most bikers don’t care about all of the tourists. They live in the city, and they’ve seen the Brooklyn Bridge a thousand times. They don’t care if they hurt you, and they’ll let you know what they think about you. Expect that this will happen. NYC is not the happy Disneyland esque paradise that all of the advertisements will lead you on to believe. Everyone is busy in their own world. Most New Yorkers in general are just selfish. If you accept this fact then you’ll laugh at all of your encounters with the people. It’s this or you’ll rethink your life choices in embarrassment as the people try to intimidate you. Even some of the older guys on my team willingly go back and forth with angry bikers. 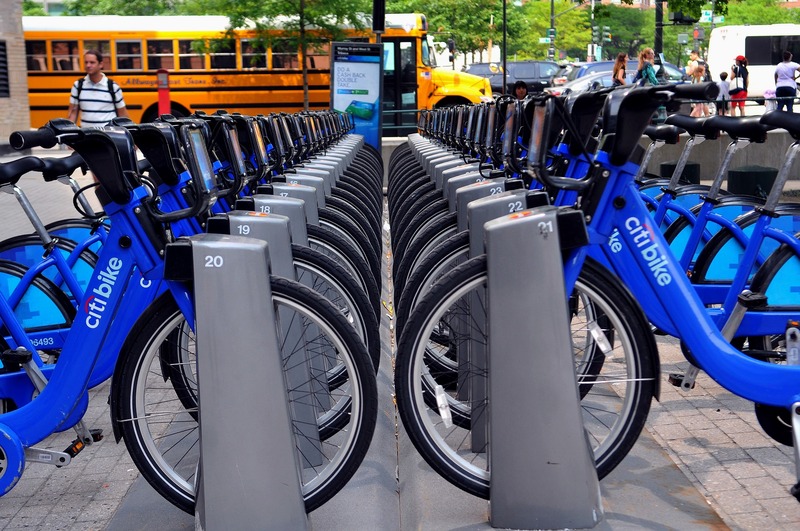 I remember during a long run up Chelsea Piers to Central Park, a biker called us out for running in his bike lane. We were in the wrong (that time), and we didn’t look back and move out of the way for the guy this time. My teammate still wanted to taunt him. He basically told him to shut up and “bike faster because middle age is catching up with you.” He yelled over him whenever the biker tried to defend himself. Even a couple of my teammates were surprised at this savage backlash. We’ve run in NYC so many times that our brains have been rewired to expect and purposely engage in arguing with bikers. If we travel anywhere else, it takes a little while for us to adjust to how people treat us. When we travel down to Florida, or when I visit my home back in California, I’m surprised by how nice and courteous other bikers are. 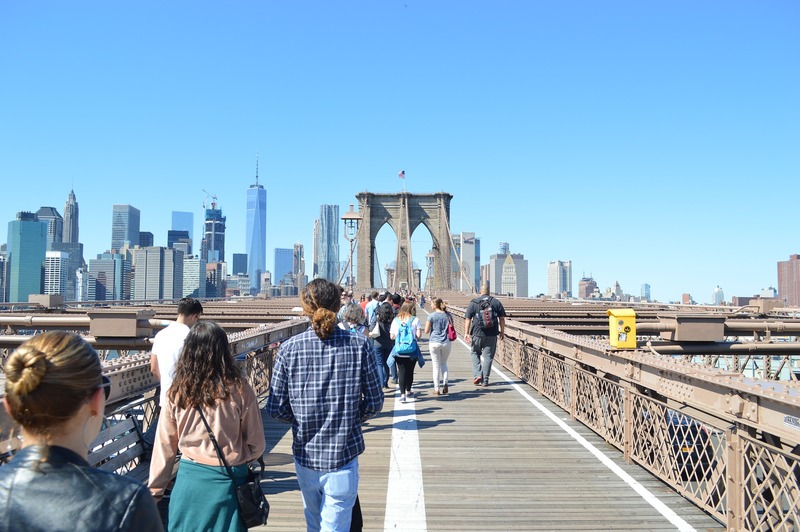 When you run through the Brooklyn Bridge you’ll look left and right and notice how everyone is trying to find that perfect position for a photo. You get an awesome view of the island that Manhattan is. If you look closely you can faintly see the Statue of Liberty in the distance. The wood architecture of the bridge is what makes it stand out as a tourist attraction, and people want proof that they were there. It doesn’t matter if they’re sweating in humid 90 degree weather, or freezing in the sub 30 rain. These people want their picture. The people taking a picture don’t expect you to jump right into a photobomb. You’re running after all, and you seem tired and busy. It’s just as simple as making a hang loose sign, and facing their camera while you run if you want to surprise some people. If you don’t get it the first time you run on the bridge, don’t worry. This place is jam packed with tourists everyday. You’ll get easy-going tourists who’ll laugh along with your photobomb, and other time’s people will completely flip out at you (and flip off). Don’t let it disturb you, it’s not likely they’ll run straight after you. If they do, you’re a trained athlete so you won’t have any issue outrunning them. The bridge will be like a never ending hill for them, while you’re coasting your way off into the streets of Brooklyn. On one rare occasion, one of my teammates had to try and outrun an angry biker. My friend kept on looping around a building and in between the crowds so that the biker would give up. That’s a different story altogether, but remember that as a trained runner you don’t anything to worry about if you’re doing something as harmless as appearing in a picture. Throughout the week, my teammates and I will run to different areas in the city. At times, we will randomly choose where to run on any given day. When you’re running downtown and pass City Hall, you’ll immediately be greeted by a salesman trying to give you a selfie stick. You might even be greeted by six of them, just run right past them and don’t be afraid to give them a high five on your way up from the bridge. Now you’ll slide your way past the people making their way up the bridge, simply say excuse me as you out stride them if you don’t want to feel like a complete jerk. As I warned in my past article, the biker’s here will rush along because they’re sick of seeing the tourists crowd up their path. There’ll be designated bike lanes and pedestrian walkways so it’s important to be self aware about where you’re headed. It’s easier to just look straight ahead on the opposite of the walkway so you can avoid the walkers and can see the upcoming bikers going right at it-full speed. As my teammates and I accelerate on this first part of the bridge, I’ll take the time to look for the Statue Of Liberty which can faintly be spotted in the distance. I highly recommend that you take in all that you can during the top part of the bridge. The wind might sometimes be overwhelming, but it’ll feel good especially on a hot day. Throughout your journey to the top, remember to watch out for those ninja esque- bikers. There’ll be turns and posts set up so that you have to circle around certain parts of the bridge. Now when you start to run down the Brooklyn Bridge and coast, you’ll be greeted with a wealth of opportunities to photobomb. Selfie sticks will line up for you in such a way that you can sprint from left and right and flash your picture perfect teeth. The wooden bridge will be perfect for running down, but on a rainy day it’ll turn to a slip and slide. Remember, to stay on the opposite side of where the bikers will come from. This time on the other side of the bridge, you don’t want an accelerating biker to run your foot over.